As a dedicated foot and ankle surgeon with a passion for personalized patient care, Mariola Rivera, DPM, is a leader in innovative solutions. Dr. Rivera welcomes new and existing patients to Aesthetic Podiatry & Sports Medicine Center, located in White Plains, New York. 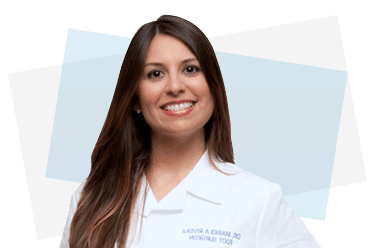 Dr. Rivera, earned her Doctor of Podiatric Medicine from the New York College of Podiatric Medicine in New York City and went on to complete a competitive podiatric medicine and surgical residency at the Bellevue Hospital Center in New York City. She currently maintains professional memberships with the American Podiatric Medical Association and the New York State Podiatric Medical Association. With her extensive training in foot and ankle surgery, Dr. Rivera is a highly regarded surgeon for aesthetic and deformity corrections. Dr. Rivera also has special interests in wound management and sports medicine and regularly treats runners, ballet dancers, and other athletes. Because Dr. Rivera wants her patients to get back into their normal activities and stay active, she offers personalized conservative treatment packages. If surgery is indeed the best resort, Dr. Rivera uses minimally invasive measures to make repairs to help restore your full function. Patients of Dr. Rivera appreciate the time she spends with them during appointments, thoroughly evaluating their conditions and educating them about treatment options. Since she’s fluent in both English and Spanish, Dr. Rivera can communicate with patients from diverse cultural backgrounds.